Justin Edinburgh is hopeful he is closing in on the final piece of the Cobblers’ attacking jigsaw. The Cobblers boss was delighted with the signing of Billy Waters from Cheltenham last week, meaning the club has five strikers going into the new campaign. Waters joins Marc Richards, Alex Revell, Leon Lobjoit and Joe Iaciofano in the striking ranks, and although Edinburgh is pleased with the options that gives him, he is targeting one more player, who will be able to play up front or on the wing. Sam Hoskins, Daniel Powell and Sam Foley are the Cobblers’ current attacking options in wide areas, and Edinburgh said: “I think there is an area where we could perhaps have another player who can play wide, or in a forward position. “There is another player I have met, and we are waiting for him to make a decision. Having versatile players is going to be key for Edinburgh, who says he is aiming to carry a smaller squad in the new season than the club did last term. 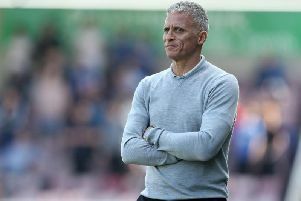 “We are going to go with a smaller squad, but one where players can play in different positions,” revealed the Cobblers boss. “It’s not so much about them being utility players, but being somebody who is versatile and is comfortable playing in a couple of positions. The Cobblers have brought in five players over the close season to date, with Foley, Powell, Leon Burnett, George Smith and Waters all signing.